While renters might not be able to rip out cabinets or excise egregious countertops, there are practical fixes that needn’t last longer than your lease. Deb Perelman, author of the food blog Smitten Kitchen, has encountered her share of cook space conundrums in the 14 years she’s been a New York City renter—insufficient storage, unsightly counters, and one kitchen that was a mere 42 square feet. Despite those challenges, she’s been able to make do with a few effective, affordable, and temporary solutions. “I look for things I can take with me to the next apartment,” she says. Here, Perelman shares her tips. Perelman tells us: “My movable kitchen island provides me with additional counter space." She purchased hers from Wayfair.com. 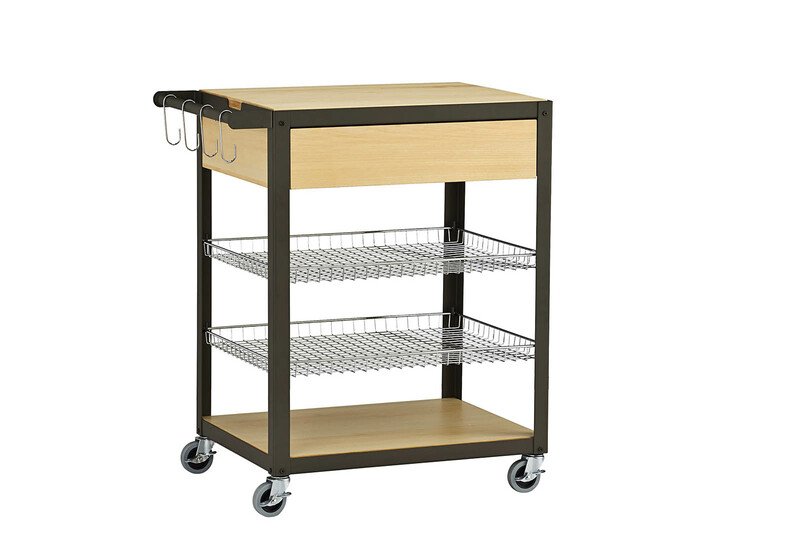 We're partial to the Mise en Place kitchen cart by Ceci Thompson for CB2 ($399). In more than one of her rentals, Perelman suffered from a dearth of kitchen drawers. We like this piece for its sturdy iron frame, three shelves (two of which are mesh—a good option for produce storage), chrome hooks, pull-out drawer, and removable ash-wood top that doubles as a serving tray. "Very ugly countertops are common," Perelman says. "I've mostly gone in the grin and bear it camp, but at the same time I think investing in a beautiful cutting board will make you feel much better about your kitchen. I bought a beautiful black maple cutting board and I'll always have it. You could probably get one the size of your counter. The whole idea is you can take it with you." This 12-by-20-inch walnut board is available from Jewett Farms Workshop for $46. “Get a hanging pot rack. It frees up more than one cabinet’s worth of space,” Perelman advises. The Enclume Contemporary Oval Pot Rack is available from Williams Sonoma ($700). For a more affordable option, consider this forest green rack by Old Dutch International ($80). We like this DIY design by Margaret Oomen. She put a couple of coats of black chalkboard paint on a standard peg board purchased from Home Depot to create a display for her collection of vintage wood spoons. We queried Perelman about her essential kitchen tools and one of the most versatile for her is a cast iron skillet. Lodge manufactures its wares in the USA and they're easy on the wallet. This 12-inch option is $37. "You can use it as a roasting pan and you can use it as a frying pan to cook anything on the stove," she says. "Mine cost $20 full price. If you take care of it, you could hand it to your grandkids. Cast iron pans are great, especially if you're feeling broke and it's your first kitchen." "I think a dutch oven is a great thing to have, somewhere between five and seven quarts," Perelman says. This six-quart cast-iron pot, also from Lodge, is $59. "An eight-quart dutch oven is good if you feel like you want to cook for crowds. Five quarts is great for like everyday meals for 4-6 people, but a bigger one will cover more things on the big side. I'm not saying you have to buy a Le Creuset; you'll be fine with whatever brand is in your budget. I would say that, though, if you have loving and adorable family members, for Christmas gifts it's a great time to ask for one. They're not usually break the bank on the gift scale. If a couple of people can get together it's a great present. With a skillet and a dutch oven, you can do a whole lot. After that, for me, the next essential tool is a good wooden spoon." "I don't like traditional spatulas very much," Perelman says. "I always find them a little thick and cumbersome, but I love using what's called a flexible fish spatula and there's no reason just to use it for fish; I use it for everything. It's a thinner metal spatula that's a bit bendy. It's like razor thin so you can slide it under anything really easily. I use it to loosen cakes from pans and to get them off a springform base. I've gotten rid of pretty much every metal or bent spatula for this instead." Sur La Table sells stainless-steel versions for $9–$17. "I love metal tongs," Perelman says. "I've had my pair for about 15 years and I'm going to cry when they break because you can't buy them anymore. You can open and close it with one hand. You can flip your wrist back and it locks. and you can flip it down and it opens. This is my hand in the kitchen. I use it for everything. Flipping sausages and meat and on the grill too. I've used it even to flip pancakes—they're sturdy enough." Provisions, the retail side of Food 52, has a handsome version with wood handles for $38. Geared to multigenerational users, the 13-piece line of bathroom or kitchen accessories by MAP Project Office for Sabi includes mirrors, hooks, a towel bar, caddies, and shelves. Each item comes with a handy installation kit and can be mounted with high-strength, removable adhesive tape—save for the grab bar, which must be screwed in to meet safety requirements. Mounting traditional wallpaper and undertaking painting projects can be laborious affairs. Consider using self-adhesive coverings, like the Squares Squared wallpaper by Chasing Paper ($30 per four-by-two-foot panel) to swathe backsplashes, cabinets, and walls for a face-lift that will be easy to remove when your tastes change or you upgrade to a nicer pad. Designed to stick to common kitchen and bath materials such as tile and glass, the Stugvik hook by IKEA (two for $10) offers a way to hang objects—think bulky towels, squeegees, loofahs, and scrub brushes—weighing up to two pounds. Reserve heavier items for screwed- or nailed-in hooks. Suitable for applications on vertical surfaces, Smart Tiles by Quinco & Cie Inc. provide a DIY solution for unsightly backsplashes or walls. The adhesive tiles can be installed without special tools. Though heat- and humidity-resistant, they should not be used in showers. Smart Tiles also offers multicolor options.